The KElbowVisualizer implements the “elbow” method to help data scientists select the optimal number of clusters by fitting the model with a range of values for \(K\). If the line chart resembles an arm, then the “elbow” (the point of inflection on the curve) is a good indication that the underlying model fits best at that point. To demonstrate, in the following example the KElbowVisualizer fits the KMeans model for a range of \(K\) values from 4 to 11 on a sample two-dimensional dataset with 8 random clusters of points. When the model is fit with 8 clusters, we can see an “elbow” in the graph, which in this case we know to be the optimal number. By default, the scoring parameter metric is set to distortion, which computes the sum of squared distances from each point to its assigned center. However, two other metrics can also be used with the KElbowVisualizer – silhouette and calinski_harabaz. The silhouette score calculates the mean Silhouette Coefficient of all samples, while the calinski_harabaz score computes the ratio of dispersion between and within clusters. The KElbowVisualizer also displays the amount of time to train the clustering model per \(K\) as a dashed green line, but is can be hidden by setting timings=False. In the following example, we’ll use the calinski_harabaz score and hide the time to fit the model. It is important to remember that the “elbow” method does not work well if the data is not very clustered. In this case, you might see a smooth curve and the optimal value of \(K\) will be unclear. The K-Elbow Visualizer implements the “elbow” method of selecting the optimal number of clusters for K-means clustering. K-means is a simple unsupervised machine learning algorithm that groups data into a specified number (k) of clusters. Because the user must specify in advance what k to choose, the algorithm is somewhat naive – it assigns all members to k clusters even if that is not the right k for the dataset. 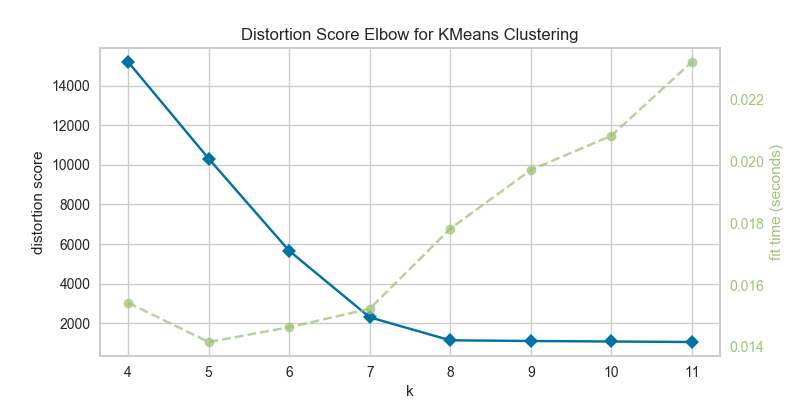 The elbow method runs k-means clustering on the dataset for a range of values for k (say from 1-10) and then for each value of k computes an average score for all clusters. By default, the distortion score is computed, the sum of square distances from each point to its assigned center. Other metrics can also be used such as the silhouette score, the mean silhouette coefficient for all samples or the calinski_harabaz score, which computes the ratio of dispersion between and within clusters. When these overall metrics for each model are plotted, it is possible to visually determine the best value for K. If the line chart looks like an arm, then the “elbow” (the point of inflection on the curve) is the best value of k. The “arm” can be either up or down, but if there is a strong inflection point, it is a good indication that the underlying model fits best at that point. Should be an instance of a clusterer, specifically KMeans or MiniBatchKMeans. If it is not a clusterer, an exception is raised. The k values to compute silhouette scores for. If a single integer is specified, then will compute the range (2,k). If a tuple of 2 integers is specified, then k will be in np.arange(k, k). Otherwise, specify an iterable of integers to use as values for k.
metric : string, default: "distortion"
Display the fitting time per k to evaluate the amount of time required to train the clustering model. If you get a visualizer that doesn’t have an elbow or inflection point, then this method may not be working. The elbow method does not work well if the data is not very clustered; in this case, you might see a smooth curve and the value of k is unclear. Other scoring methods, such as BIC or SSE, also can be used to explore if clustering is a correct choice. For a discussion on the Elbow method, read more at Robert Gove’s Block. The scikit-learn documentation for the silhouette_score and calinski_harabaz_score. The default, distortion_score , is implemented in`yellowbrick.cluster.elbow`. Draw the elbow curve for the specified scores and values of K.
Fits n KMeans models where n is the length of self.k_values_, storing the silhoutte scores in the self.k_scores_ attribute. This method finishes up by calling draw to create the plot.